1. Take one end of your Buddy Braids wire and thread 1 crimp bead approximately an inch from the end. Thread the rectangle end of your toggle clasp. Thread the end back through the crimp bead. Using crimping pliers (or any pliers you have) squeeze the crimp bead about a 1/4th of an inch away from the clasp. See below. Leave the excess you will thread the beads over both ends. a. 1 – Plum AB 8x5mm Crystal Rondelle, 1 - Antique Copper 6x9mm 6-Point Bead Cap, 1 - Antique Copper 1.5x4mm Beaded Rondelle, 1 - Antique Copper 4x10mm Curly 5-Leaf Bead Cap, 1 - Calcite 10mm Semiprecious Round, 1 - Antique Copper 4x10mm Curly 5-Leaf Bead Cap, 1 - Antique Copper 1.5x4mm Beaded Rondelle, and 1 - Antique Copper 6x9mm 6-Point Bead Cap. b. Repeat Pattern in Step (a.) FOUR (4) times. c. 1 – Plum AB 8x5mm Crystal Rondelle. 4. Thread 1 crimp bead and the bar part of your toggle clasp. Thread the wire back through the crimp bead after going through the loop on the toggle clasp. Thread the wire through the last several beads (see below). Using your pliers, squeeze the crimp bead about a 1/4th of an inch away from the clasp and an 1/8th of inch away from the last bead to have room for your crimp cover. Trim the excess wire as close to the bead as you can. You are done! These directions make a bracelet that is approximately 7 inches long. 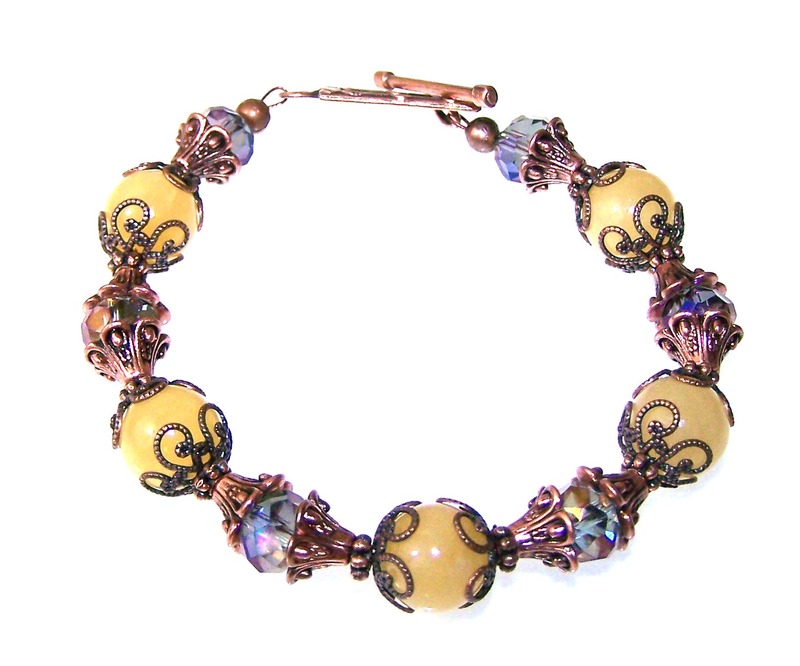 If you need to change the length, just add or subtract beads. You can use this beading pattern with any color beads you like!